What is Hydrotherapy/Aquatic Therapy/Pool Therapy? Aquatic Therapy also known as Hydrotherapy or Pool Therapy is a type of Physiotherapy that incorporates exercises and manual techniques performed in warm water to rehabilitate patients after injury or to manage chronic conditions. Working in the water allows walking, running and resistance activities as well as manual therapy techniques with decreased joint compression to aid in efficient, effective recovery and to promote early intervention. Why Choose Hydrotherapy/Aquatic Therapy/Pool Therapy? 1) Buoyancy: Buoyancy produces a force that supports up to 50% of a patient’s body weight when water level is up waist level and even more when water is deeper. This allows a person to move more easily with decreased stress on muscles, joints and bones making aquatic therapy perfect for patients that have difficulty with weight bearing exercises. The buoyant properties of water also allow patients to exercise even if they have weight bearing restrictions due to fractures, sprains or surgeries. 2) Resistance: Resistance in water can be felt in all directions compared to on land gravity provides resistance in only one direction. Multi-directional resistance allows more efficient muscle strengthening increasing muscle tone at a faster rate than most typical land exercises. Resistance coupled with buoyancy allows patients to strengthen muscles while minimizing joint stress, resulting in less pain. 3) Hydrostatic Pressure: Hydrostatic pressure increases with depth of submersion, which explained simply means the deeper you go under water the more pressure you will have on your body. Hydrostatic pressure during aquatic therapy helps circulate blood from the legs back to the heart resulting in reduction of swelling in the ankles, feet and legs. Reduced swelling helps decrease pain, decrease joint tenderness and increased range of motion. Hydrostatic pressure also aids in increasing proprioception (joint awareness of position) which is important for patients working on balance as well as patients recovering from joint sprains. 4) Heat: Shelbourne Physiotherapy offers aquatic therapy in a heated pool, 85 degrees. The warm water allows muscles to relax, improving flexibility and range of motion. Heat also helps increase circulation and blood flow to the site of injury, providing delivery of oxygen, nutrients and healing factors to the damaged tissues. 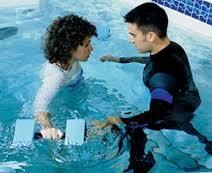 Who Can Benefit from Hydrotherapy/Aquatic Therapy/Pool Therapy? If you are interested in learning more about our Hydrotherapy/Aquatic Therapy Program ask your Physiotherapist for more information or call (250)-595-5858 to schedule an in clinic evaluation. Please call our Rehabilitation Coordinator Madeline Juba to inquire about our services in the pool. 250-595-5858. 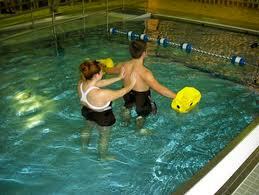 Hydrotherapy & Aquatherapy in Victoria, B.C.